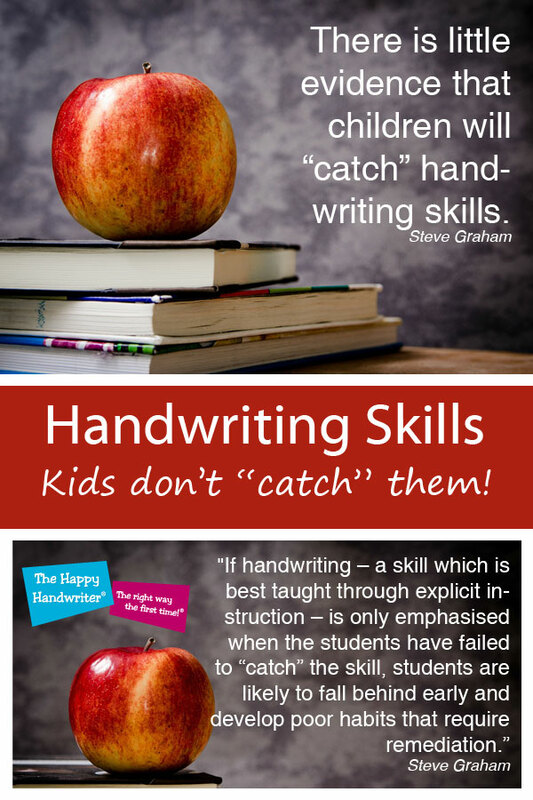 “There is little evidence that children will ‘catch’ handwriting skills!” (Steve Graham, 1999.) I love this quote! Handwriting is not like the flu. You don’t catch it simply because you happen to spend time with those who are engaged in the activity. You learn to become an efficient handwriter because handwriting is taught. This begs the question as to how we can find time in our jam-packed school days for teaching handwriting? 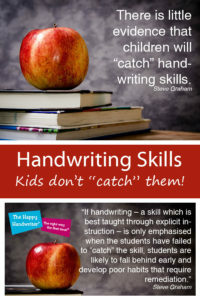 Steve Graham, a Professor of Education at Vanderbilt University who has done extensive research into handwriting, goes on to say: “If handwriting – a skill which is best taught through explicit instruction – is only emphasised when the students have failed to “catch” the skill, students are likely to fall behind early and develop poor habits that require remediation.” (Graham, 1999). And this finds us in a bit of trouble because the expectations on our teachers in terms of what they must magically pack into the school day are enormous. This is why back in Granny’s day, our children had the handwriting advantage. There was time, and with that, came repetition and the daily practise of handwriting. But now we don’t have time, and we also don’t have the same solid fine motor foundations on which to build. Yes, back in Granny’s day there were children who experienced fine motor challenges, but it wasn’t of the epidemic proportions we see today. And it is with these weak fine motor foundations our children enter school. Combine this with a pressurised programme which no longer provides the leisurely opportunity for daily handwriting practise, and suddenly we are in trouble. As Steve Graham said, handwriting needs to be taught. Teachers are in a no-win situation. 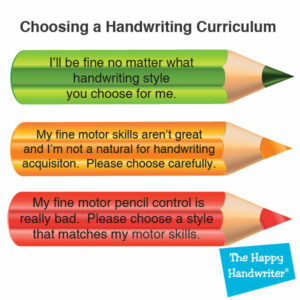 Children’s fine motor skills and pencil control are generally weak and there seems to be little time left in the day for formalised handwriting instruction. Not only is there handwriting, there are now computers and keyboarding skills as well. How can this fit into the day and what can give? And so often it is handwriting. I stress it is not because our teachers are incompetent, it is because there simply isn’t enough time in the day, and choices need to be made. Handwriting in the Techno Age: 5 Reasons it Should Stay looks at the arguments for abandoning handwriting in favour of technology. It starts by exploring why handwriting is an evaluation and learning tool. It goes on to discuss the research that early pre-handwriting abilites in Grade R have an impact on reading and maths performance in Grade 2. Then, it considers the research that good handwriting skills are directly related to improved writing and composition skills throughout primary school! And, finally, that handwritten notes improve conceptual learning in students in tertiary education. 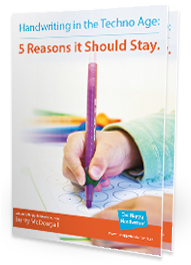 Once you have read this evidence based eBook, you will have to agree handwriting is a must. Once you have considered the fact that handwriting truly does need to be taught and that our children are not going to “catch the skill,” we have to have a think tank. We must look at the demands of the day. And we need to find what should to be taken out to allow for sufficient time for this critical skill. We can’t just keep on adding things in – our children are already overwhelmed – but we have to find a way to get handwriting back in the priority position it deserves. More and more schools are so very successfully adopting the Grade R and Grade 00 Muscle Mania programmes. This is setting in stone a twice weekly fine motor and preschool pre-handwriting development slot at this level. This goes a long way to ensuring our children have the fine motor and pre-handwriting foundations in place for teaching handwriting when they arrive in Grade 1. In addition, we need to teach handwriting “smarter.” We cannot simply adopt the watch and copy approach. I have had teachers report to me that, at the undergraduate level, they receive one afternoon lecture on how to teach handwriting. This is a serious dis-service to our children who need well-established handwriting foundations for story writing, ensuring the working memory is not taken up by pondering on how to form a letter, and to promote memory and assimilation of knowledge. For those at home who would love to have a system to follow to assist their children with handwriting foundations, our Handwriting Bundles are designed for just that. Choose from Grade 00, Grade R, Grade 1 and Cursive Handwriting Bundles. Get your free copy of this article on teaching handwriting by entering your details in the form below.